Okay I'll admit it, I'm going a little bowl crazy these days. It's all I find myself eating and creating, and since they're one of those meals that are just the simplest to throw together (which I know you and I both love), when I come up with a good combo, I'm gonna share it with you. Agreed? Agreed. And this one I have to say is particularly fun. Why? Because, instead of simple roasted squash/sweet potato (which tends to be my go-to), it's got spiralized butternut squash. Yes, that means squash turned into noodles. So veggie noodles. So basically the best thing ever. How you might wonder? 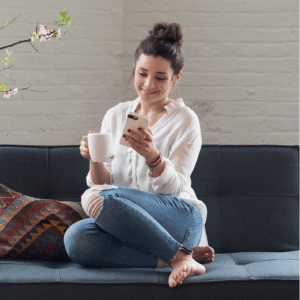 One simple tool that I can't imagine living without: my inspiralizer. Now you've heard about my love for spiralizing, but it wasn't until I got The Inspiralizer that I fully appreciated the world of veggie noodles. You see my old spiralizer (which was the Paderno one from Amazon) could only really handle the easy vegetables. Things like zucchini and cucumbers. Not hard ones like beets and butternut squash. That's why I love this tool. It can handle anything. Which means…more healthy noodles! 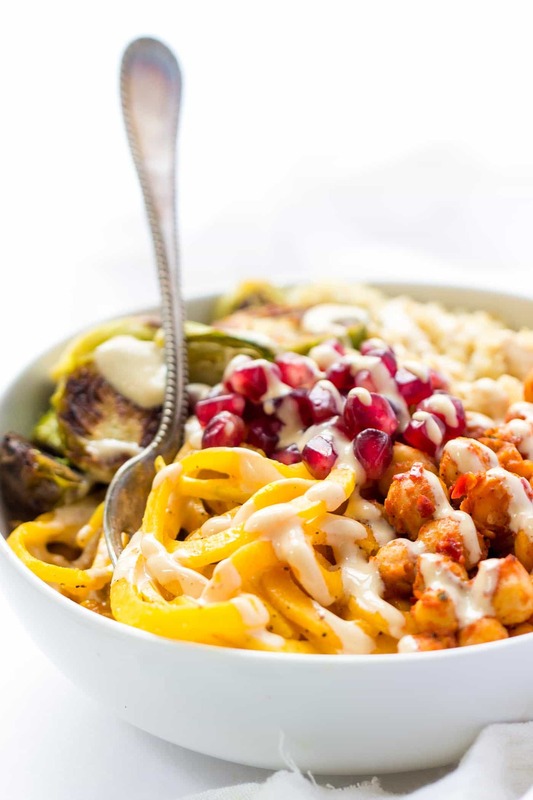 In addition to our lovely spiralized butternut squash, the other star of this dish is the harissa chickpeas. 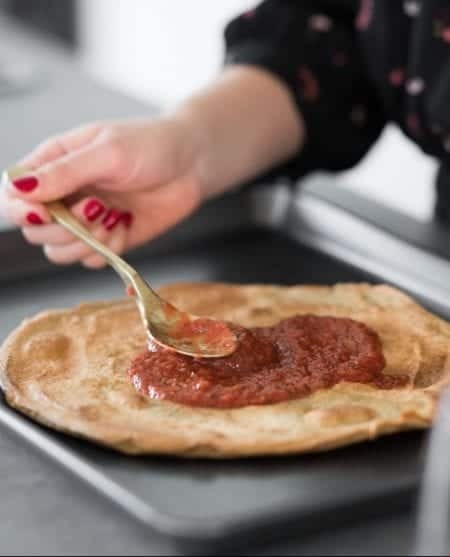 Until this recipe I had never had harissa before and honestly didn't know what to expect, but it caught my eye the other day when I was grocery shopping and I had to try it. I just love the name – it sounds so exotic and fun. Plus since I was craving a warm bowl, I heated the chickpeas up in a skillet and tossed them in the harissa until they were a little crispy. It made the whole thing so much more cozy. If you're looking for a simple and delicious weeknight dinner, this is it my friends. The whole thing came together in about 40 minutes and makes for great leftovers. If you do end up wanting to save some for leftovers I would recommend storing the ingredients separately. 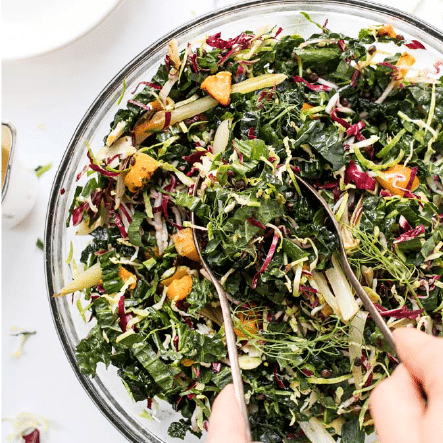 It will help them keep their individual flavors and then once you're ready to serve it pop it into your bowl and top it with the dressing. One last thing about the dressing: it can be made ahead of time and stored in the fridge. I actually keep a jar of this on hand since I love it on bowls and even salads. 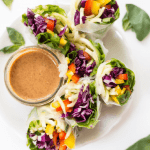 The miso + tahini combo? Magical. Have you ever tried spiralizing before? What is your favorite veggie? 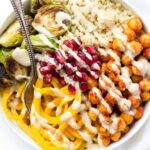 Would love to hear about your spiralizing adventures in the comments! AND if you haven't tried it before and are in the market for a spiralizer, I highly HIGHLY recommend The Inspiralizer. I've tested a bunch of machines and this one is by far the best. It's easy to use, easy to clean and can spiralize anything. And my friend, if you end up creating this dish or any other recipes from the site, I'd love to see your creations. Make sure to use #simplyquinoa and share a pic on Instagram! 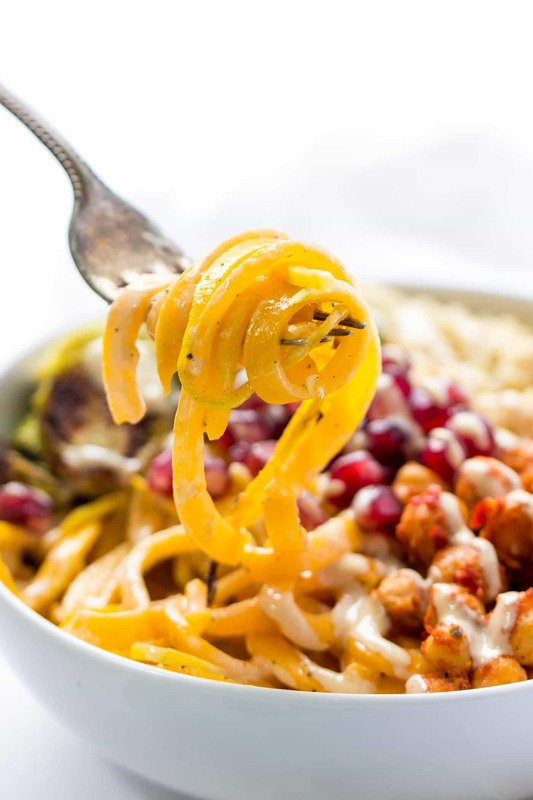 Instead of simple roasted squash/sweet potato (which tends to be my go-to), it's got spiralized butternut squash. Yes, that means squash turned into noodles. So veggie noodles. So basically the best thing ever. Preheat the oven to 400 degrees. Toss the brussels sprouts in some oil, salt + pepper (optional) and transfer to a baking sheet. Roast in the oven for 20 - 25 minutes until browned and soft. Once the brussels are in the oven, prepare the butternut squash. I used this method for peeling and spirazling (I had a medium butternut squash for these 4 bowls). When the brussels have about 5 minutes left, add the squash noodles to the pan and roast until tender. Remove from the oven and set aside. 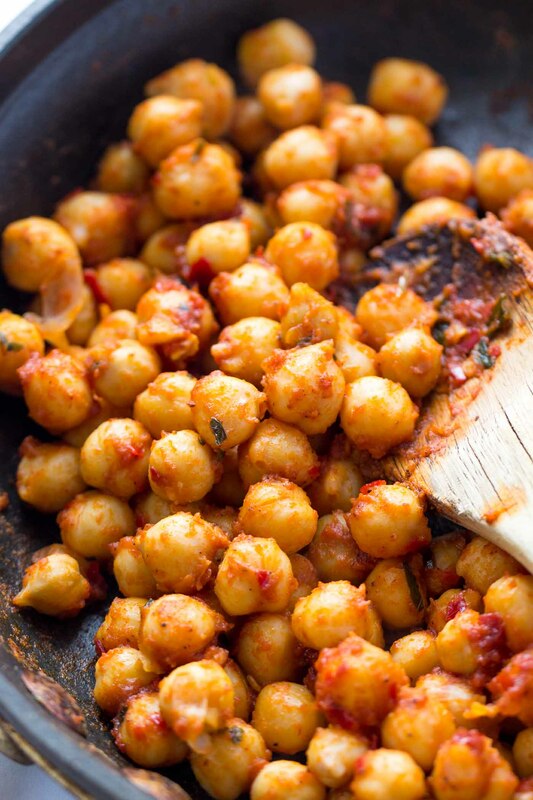 Add chickpeas, harissa and water to a skillet. Cook until chickpeas are warm and starting to get a little crispy, about 5 - 7 minutes. Remove and assemble the bowls. 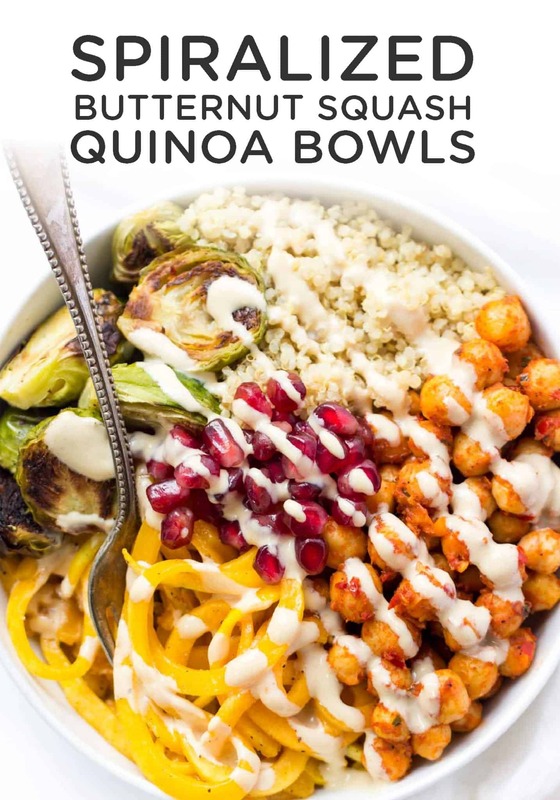 Evenly divide ingredients among four bowls, arranging quinoa, chickpeas, squash noodles, brussels sprouts and pomegranate however you'd like (I do mine in a circle). What a powerhouse of a bowl! This looks like the classic way to get some strength midday. 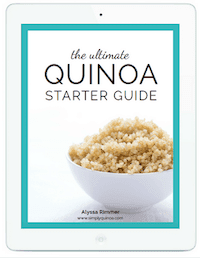 I read a lot about quinoa and its health benefits are really interminable. I’m new to this but what do you do with the miso paste, tahini, ginger and tumeric? It’s not in the recipe or did I miss it? Hi there! do you have nutritional info on this salad? And what is ‘harissa’ paste? thank you! I don’t have it calculated at the moment and harissa paste is usually found with the Asian/Indian cuisines at most grocery stores! I have also been debating getting a spiralizer, one by hand, but this, this is superb no need for extra labor. I am not a huge fan of chickpeas unless they are mashed into hummus or falafel so I will try this with hummus as an extra dressing. 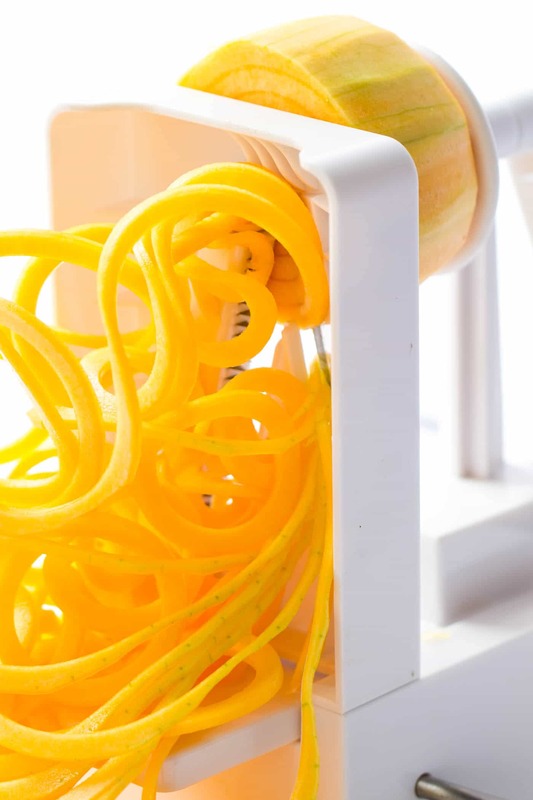 The countertop spiralizer is a game changer. Can’t recommend it enough! No coincidence that I’m having zoodles tonight, is it? 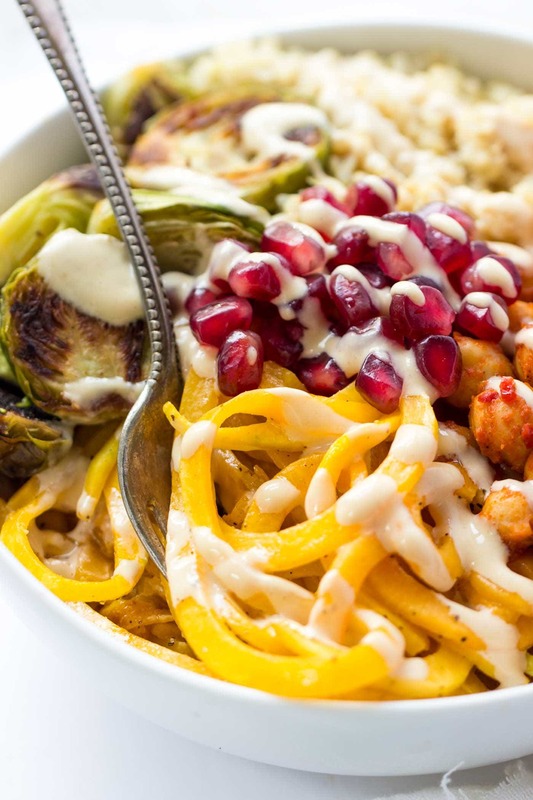 😉 I’ve NEVER tried spiralizing butternut squash–I’ve only had it in soups or stir-fries, but this just sounds really clever and amazing. 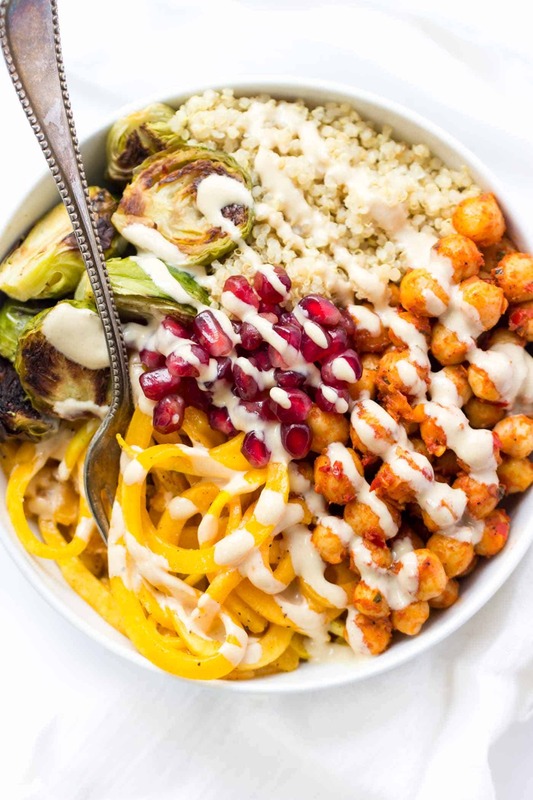 I love the idea of serving it almost like a Buddha bowl with chickpeas and quinoa for a really healthy and balanced dish. You’ve got to try it – they’re delish! These are so dreamy!!! Literally all my favorite things in one bowl. But I guess that’s how most of my meals go….straight in a bowl. I’ve never had harissa but I need to grab some now! Also, that noodle shot is bae. Been thinking about purchasing a spiralizer for a while now, this recipe may just be my tipping point! How easy is the Inspiralizer to clean? SO EASY! Easier than any of the others I’ve tried. And it also has a bunch of other features which makes storing it a breeze. I can’t recommend it highly enough! can you use a different spiralizer – one of the hand held ones? Thanks! I really enjoy your recipes so I may just have to get one. Although my kitchen might just explode from one more gadget. Tiny apt means tinier kitchen. This looks great. Can you find harissa paste in the international section of a grocery store? or do you have any other suggestions if I can’t find harissa. Thanks.